Traditionally wall mounted mailboxes are fitted in front door of a home but in some residence the mail is delivered in side entry. When you get you mail delivered by a person who walks down to your home, you don’t care to install a trendy mail box but get satisfied with the age-old mail-slots fixed to the front door. However, door mail slots can be aggravating if you have children or pets. People who have a mail slot in their front door might have their bills chewed up by their dog. Thus, wall mounted mailboxes are quickly taking the place of traditional door mounted mail slots. The wall mounted mailbox you buy shall be made with such a material that suits your needs and tastes the best. Galvanized steel mailboxes are rust resistant and heavy duty. A variety of steel options exist, with greatly varying weights. Those made of heavy plated steel are practically indestructible. Aluminum Mailboxes are also rust resistant and are used in many areas of the country. 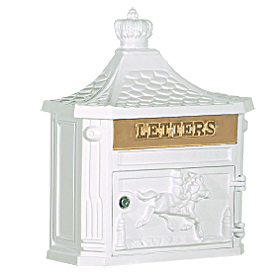 Plastic mailboxes are quite popular due to their price and level of durability. They are more durable because they can be standard or double-walled. Also rust resistant, they are an ideal choice for many homeowners. A mailbox made of brass adds class and style to your home. These require a bit more effort to keep them appearing attractive, but they can last for years.